Nusa Bestari is a place laden with yummylicious food and chain eateries, and to think years ago this place was a god forsaken land. Today, it is one of the bustling township in Johor Bahru with well connected roads to either JB city or the Iskandar area (and recently Legoland). It is by chance that we wandered into the place one late afternoon, en-route back home, stomach rattling with hunger pangs. We thought policing around the shops along the main road is our best bet, and how well it paid off. It was a reward that got me smiling from ear to ear, "A truly satisfying lunch" I said. Kang serves the usual selection of roast pork, roast chicken, roast duck, char siew and steamed chicken, and not wanting to get caught in a dilemma, we went for the 拼盘 combo where you get to choose 4 types amongst the above choices. Kang has a selection of 2, 3 or 4 combination plates for the glutton in everybody. 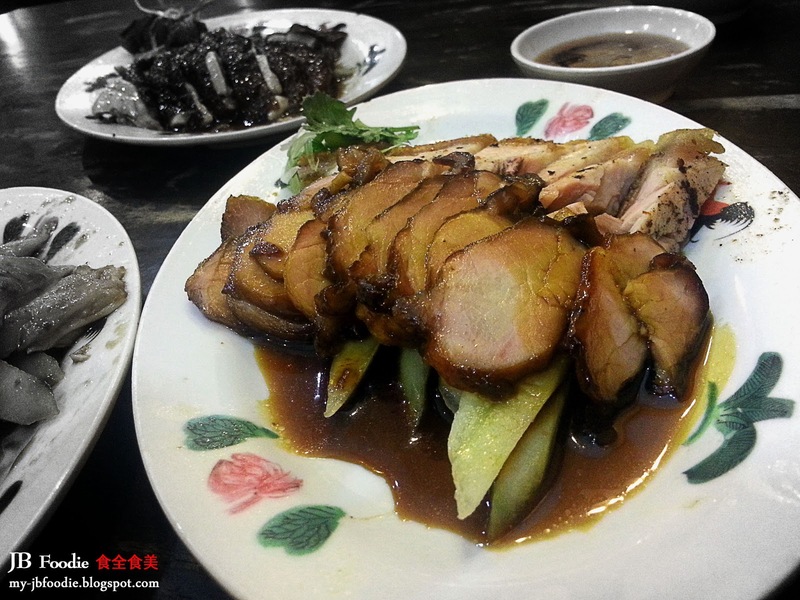 Ordered the 4 combination, which mainly consisted of roast pork, char siew, steamed chicken and roasted duck. Let's have a breakdown and review each item individually. Roast duck - Duck meat was smooth and tender, IMHO even better than Meng Meng which I've blogged about previously. Roast pork was decent, crispy on the outside and savory on the inside, but would have loved it to be in bigger chunks. The type of char siew which I fancy most - Slightly burnt & sweet, caramalized coating on the outside with a thin layer of fats in between. Steamed chicken - For lovers of that smooth texture, this isn't exactly the best I've had before, but nonetheless still gastronomically satisfying. Close up of the char siew. Conclusion: The roasted meats are comparable to Meng Meng, or even better in my opinion. Coupled with a reasonable pricing scheme, I'm not surprised to see people patronising the place beyond meal times. Recommended.